Do the benefits of technological innovation trickle down? Do technological innovations [that computer scientists produce] benefit society as a whole, or do they primarily improve the livelihood of people and institutions who are already well off? In this blog post I seek to evaluate their claim. The question I posed was admittedly vague. What exactly did I mean by ‘benefit’, and how can we possibly make a statement about all technological innovations? Does progress in information technology correlate with an improvement in poverty rates? As we see, poverty rates in the USA haven’t budged since the early 1970s, and the absolute number of people living in poverty has actually gone up. This is despite huge advances in the proliferation of information technologies like the Internet, the world wide web, and smartphones. 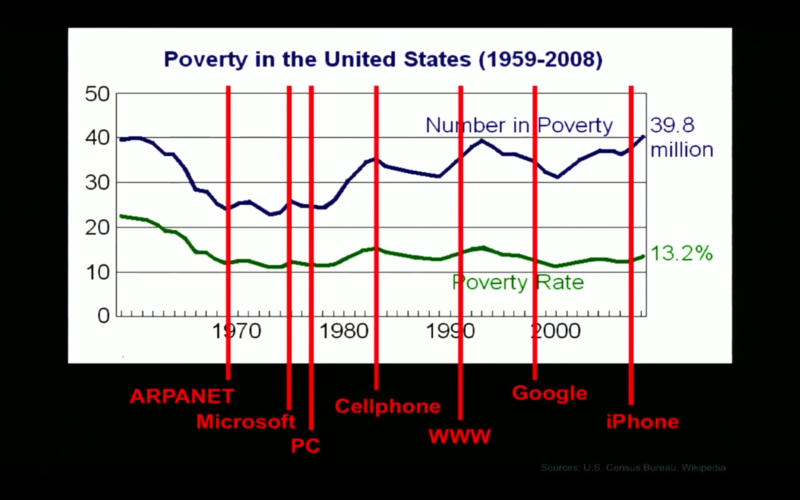 From this, we can reasonably conclude that information technology alone has not had much of an effect on poverty numbers in the USA; there must be some other factors preventing such a large number of people from getting out of poverty. 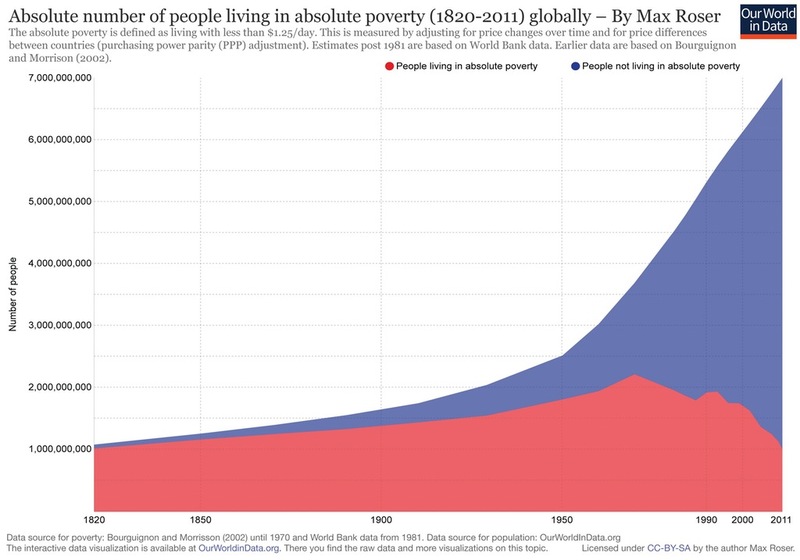 According to one reading, this data does not provide reason to doubt our trickle down hypothesis: there is a downward trend in the absolute number of people living in extreme poverty, which may be partially due to the proliferation of information technologies. A less optimistic reading is that the decline in poverty numbers we see starting in the 1970s (well before the popularity of the Web) can largely be attributed to changes in the Chinese government’s polices, and, more recently, India’s own reforms starting in 1991.3 It seems entirely feasible that information technology played a negligible role in these transformations. I’m not personally convinced that the innovations we (systems researchers) produce, which are often targeted towards the more privileged members of society, currently play a significant role in the socioeconomic well-being of the poor. My conclusion certainly does not imply that computer scientists should stop focusing on innovations targeted at the more privileged members of society. It’s very difficult to predict what kinds of impact our innovations will have; for example, the Apple engineers who developed the iPhone were explicitly targeting the rich, yet the popularity of the iPhone sparked a drive towards cellular data networks which are now the dominant mode of Internet in the developing world. It’s also undeniably true that information technology positively touches the lives of the poor, even if the jury is still out on whether it can play a significant role in helping large numbers of them develop their socioeconomic well-being. Personally, I’ve decided to pivot my direction away from high tech. I’m devoting the next year or two to understanding what role IT can play in the lives of the less privileged. We’ll see what I learn!